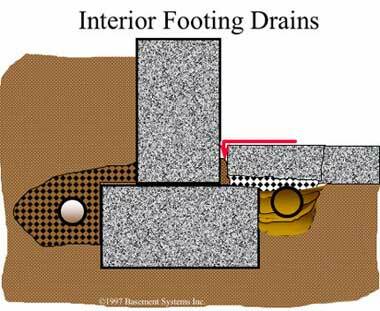 What are Interior Footing Drains (French Drains)? As with any waterproofing system of this type, this method leaves a gap between the floor and wall that allows water from the wall to flow down into the drain. 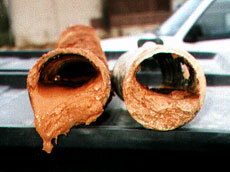 This seepage could be from a window well, a wall crack, a pipe penetration or even just condensation. Can you see how this drain is the same as the exterior one? While the drain is not sitting outside of the basement, it's still sitting in backfilled soil and will have the same potential clogging problems as the exterior system. In fact, many people that call us already have an interior footing drain! Over the course of the next few years, it's possible that soil will wash in and clog the system. And then you have to consider that all the soil that washes in came from under your foundation, which potentially causes structural concerns. The gap between the wall and floor that allows water from the wall and floor to flow in tends to collect debris from the basement floor and clog, and the overall appearance is an unsightly addition to the home.